One day rough, one day rest. 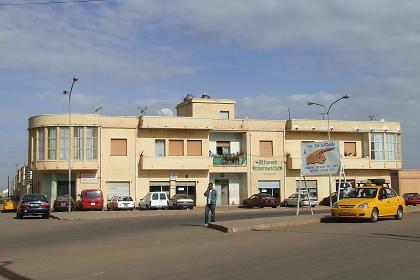 Today's walk will be through Mai Temenai, a district in North-east Asmara. I start my walk at the last bus stop of line number 2 to Mai Temenai, snaking efficiently around the main street of Mai Temenai. For some time the only excitement is the children, who are always happy to see a white man in their street. In one of the smaller alleys women are preparing suwa for a wedding. "Sit down", they say. I am introduced to the bride and her family and they offer me a chair to have some rest. And tea, and hembesha. I watch them while they make the dough to bake a very thin dark bread, and break it into pieces as the first stage of producing a kind of beer, where all neighbors participate. I taste a piece of the bread and they explain the rest of the production process. The pieces and water will ferment the rest of the week, and then be filtered, so that the drink "suwa" will remain. The residue will be used as food for the animals. I make some pictures of the the scene and resume my walk through the district. When I am close to the university area, someone calls my name. It is Aster, who visited The Netherlands recently. I had the honor to show her our Delta works, and now I am her guest to have lunch. Aster works in a veterinary shop, where all kinds of medicine and vitamins is sold to farmers for their cattle. Aster insists that I should visit her shop whenever I am in the area. 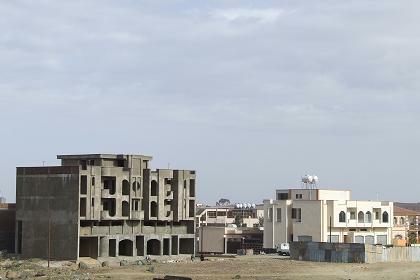 Recently built residential houses - Mai Temenai Asmara Eritrea. 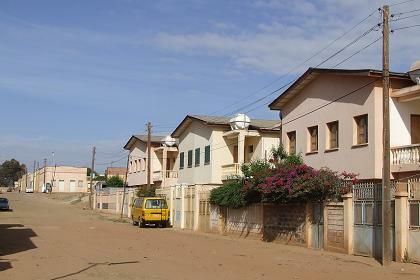 Shops and apartments - Adi Abeito Street Mai Temenai Asmara Eritrea. Construction activities - Mai Temenai Asmara Eritrea. 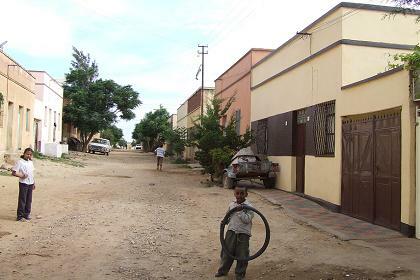 Scenic view - Mai Temenai Asmara Eritrea. 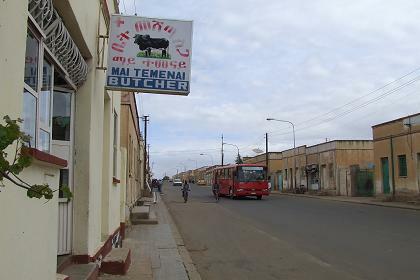 Adi Abeito Street - Mai Temenai Asmara Eritrea. 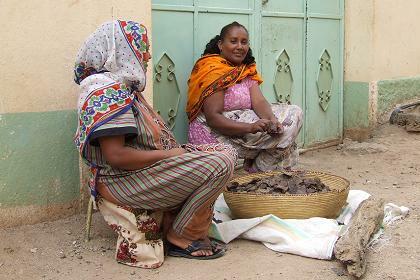 Women preparing suwa - Mai Temenai Asmara Eritrea. 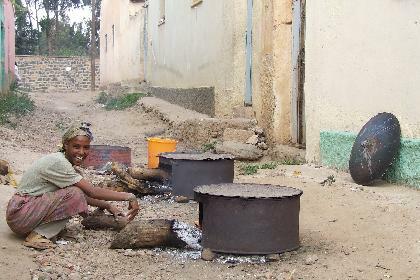 Woman preparing suwa - Mai Temenai Asmara Eritrea. 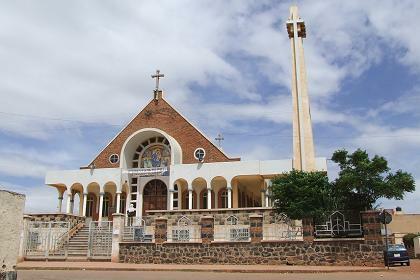 Kidane Mehret Catholic Church - Mai Temenai Asmara Eritrea. 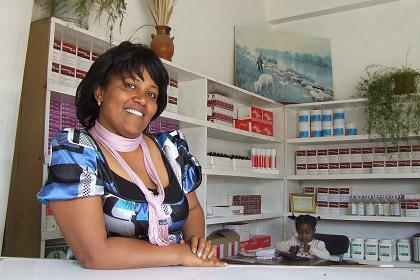 Aster in her veterinary supply shop - Asmara Eritrea. 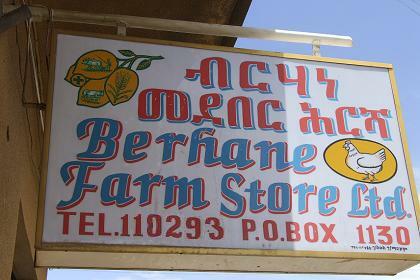 Veterinary supply shop - Asmara Eritrea.